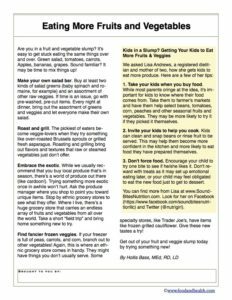 Today I want to share one of my favorite articles from the member-exclusive October edition of the Communicating Food for Health Newsletter. 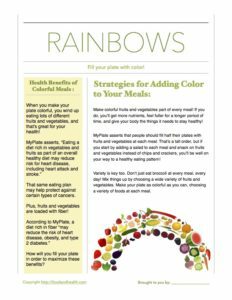 In this handout, Hollis Bass, MEd, RD, LD and Lisa Andrews, RD team up to offer fun ways to help your clients improve their eating patterns and eat more fruits and vegetables. Check it out! Make your own salad bar. Buy at least two kinds of salad greens (baby spinach and romaine, for example) and an assortment of other raw veggies. If time is an issue, go with pre-washed, pre-cut items. Every night at dinner, bring out the assortment of greens and veggies and let everyone make their own salad. Roast and grill. The pickiest of eaters become veggie-lovers when they try something like oven-roasted Brussels sprouts or grilled fresh asparagus. Roasting and grilling bring out flavors and textures that raw or steamed vegetables just don’t offer. Embrace the exotic. While we usually recommend that you buy local produce that’s in season, there’s a world of produce out there (like cardoon!). Trying something more exotic once in awhile won’t hurt. Ask the produce manager where you shop to point you toward unique items. 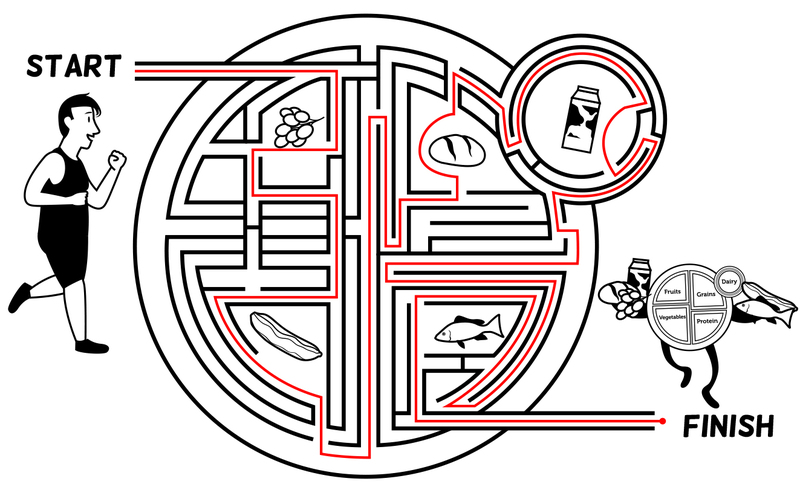 Stop by ethnic grocery stores to see what they offer. Where I live, there’s a huge grocery store that carries an endless array of fruits and vegetables from all over the world. Take a short “field trip” and bring home something new to try. Find fancier frozen veggies. If your freezer is full of peas, carrots, and corn, branch out to other vegetables! Again, this is where an ethnic grocery store comes in handy. They might have things you don’t usually serve. Some specialty stores, like Trader Joe’s, have items like frozen grilled cauliflower. Give these new tastes a try! Get out of your fruit and veggie slump today by trying something new! 1. Take your kids when you buy food. While most parents cringe at the idea, it’s important for kids to know where their food comes from. Take them to farmer’s markets and have them help select beans, tomatoes, corn, peaches and other seasonal fruits and vegetables. They may be more likely to try it if they picked it themselves. 2. Invite your kids to help you cook. Kids can clean and snap beans or rinse fruit to be served. This may help them become more confident in the kitchen and more likely to eat food they have prepared themselves. 3. Don’t force food. Encourage your child to try one bite to see if he/she likes it. Don’t reward with treats as it may set up emotional eating later, or your child may feel obligated to eat the new food just to get to dessert. 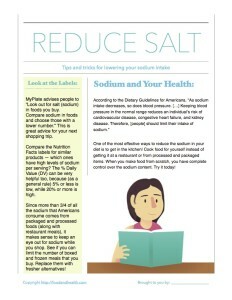 You can find more from Lisa at www.SoundBitesNutrition.com. Look for her on Facebook (https://www.facebook.com/soundbitesnutritionllc) and Twitter (@nutrigirl). Here’s a free PDF handout of this article that you can use however you’d like! There are lots of great materials that would work in tandem with this article. For example, check out this Rainbow Salad Health Fair Display Kit — it’s a perfect way to capitalize on this lesson and get your clients to make healthful choices! Shifting to a healthier eating pattern is — hands down — a great idea. That’s why this month’s display is all about encouraging manageable shifts to improve eating patterns. Banner and Stand: Change It Up or Healthier Choices 1-2-3 or both! 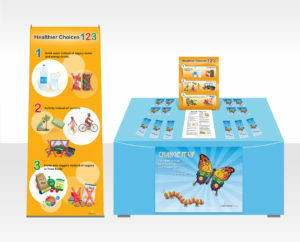 On Your Table: Healthier Choices 1-2-3 Poster on a Tabletop Easel arranged behind some Make Healthy Choices a Snap Handout (this handout is now free — get a preview at the end of this post). Discussion: What Makes Eating Pattern Shifts Sustainable? Start by setting up your space. Grab a big table and hang the Change It Up Banner in front of it. 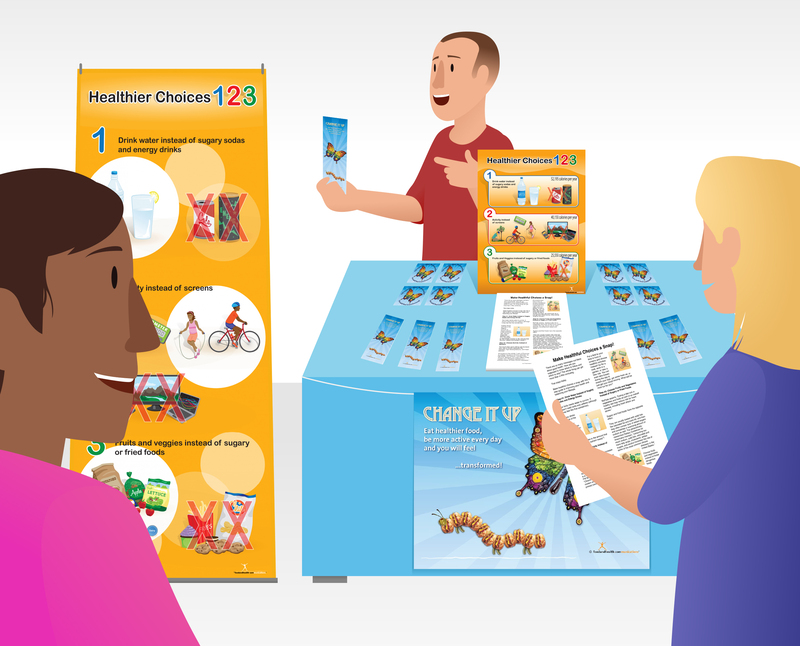 On top of the table, arrange a Healthier Choices 1-2-3 Poster on a Tabletop Easel, flanked by some Make Healthy Choices a Snap Handouts. Circle the whole thing with your prizes — a mix of Change It Up Bookmarks and Butterfly Stickers. Now, where do you have a little extra space? Where else would you like to draw the eye? Wherever that is, set up your banner: Change It Up or Healthier Choices 1-2-3 or both! Survey your arrangement. What works? What doesn’t? Adjust accordingly, then get ready for your participants to arrive. For the Make the Shift! Game, write down some common meals and snack foods that aren’t ideal for good health. On the back of each card, draft a few ideas for ways to shift that food/meal into a healthier element of a balanced eating pattern. Check out MyPlate and the Dietary Guidelines for Americans for some inspiration. Once your participants arrive, announce the game and offer prizes for fantastic answers. Decide whether you’re going to have people play individually or in teams, then hold up your first card. What isn’t healthy about that meal/food? What can people do to help shift it into a healthier choice? How sustainable is that shift? Offer extra points for creativity. Once you’ve run out of cards, tally points and award prizes to the winners (alternatively, you can toss out prizes for participation and engagement as everyone plays the game). For your discussion of What Makes Eating Pattern Shifts Sustainable? simply pose the question to the group. What kind of changes are easier to sustain over time? Why? Which are unsustainable? Why? What have people had success with in the past? What stumbling blocks have they overcome? 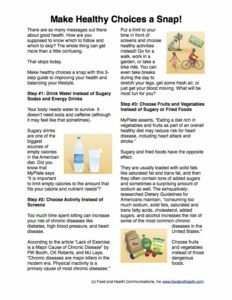 Oh, and here’s the free printable Make Healthy Choices a Snap handout for your display too! Fill Your Plate with Color! As a special treat today, I’d like to share the handout that is usually only available to people who’ve already bought the Rainbow Salad Floor Sticker! This handout is perfect for email blasts, displays, wellness fairs, and more! How will you use your copy? Make colorful fruits and vegetables part of every meal! If you do, you’ll get more nutrients, feel fuller for a longer period of time, and give your body the things it needs to stay healthy! 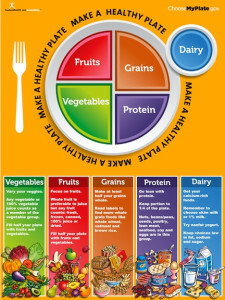 MyPlate asserts that people should fill half their plates with fruits and vegetables at each meal. That’s a tall order, but if you start by adding a salad to each meal and snack on fruits and vegetables instead of chips and crackers, you’ll be well on your way to a healthy eating pattern! Variety is key too. Don’t just eat broccoli at every meal, every day! Mix things up by choosing a wide variety of fruits and vegetables. Make your plate as colorful as you can, choosing a variety of foods at each meal. When you make your plate colorful, you wind up eating lots of different fruits and vegetables, and that’s great for your health! That same eating plan may help protect against certain types of cancers. How will you fill your plate in order to maximize these benefits? Here’s a printable copy of the handout that you can use however you’d like! Today I want to try something a little different. I’d like to offer a tour of a few lessons from some of the top posters in the Nutrition Education Store. You see, 3 different posters have been extremely popular amongst health and nutrition educators recently, and now I want to draw them to your attention. After all, my job is to help you look your very best right now. 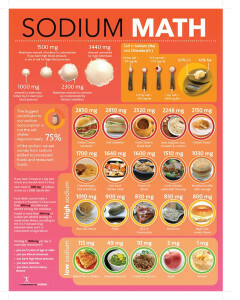 So let’s take a look at the 3 top posters in the Nutrition Education Store. 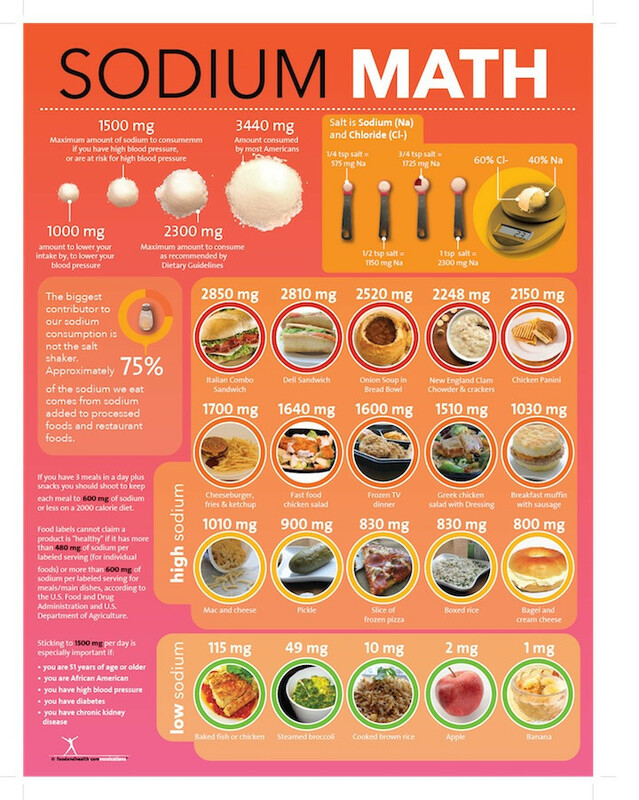 Poster #1 is the new Sugar Math Poster. 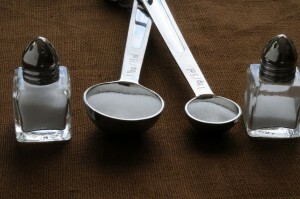 Its key lesson is to limit added sugars. How does it teach this lesson? You see, sometimes communicating important nutrition messages is a matter of breaking them down into manageable sections, making the information both accessible and memorable. This poster manages that with varied representations of just how much added sugar people should limit themselves to each day. Remember, the Dietary Guidelines for Americans advise people to “Shift to reduce added sugars consumption to less than 10 percent of calories per day.” That 10% is roughly 200 calories for the average person. 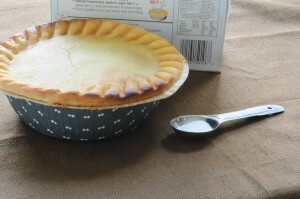 That’s equal to 50 grams, which in turn is equal to about 12 teaspoons. The Sugar Math Poster features images of each of these amounts in an approach that’s bound to appeal to a wide range of learning styles. 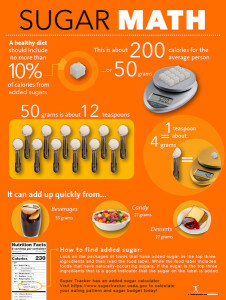 The poster also highlights key sources of added sugars and spells out how to figure out how much added sugar is in a variety of packaged foods. No wonder it’s one of the most popular posters in the store! Now let’s move on to the next poster. Poster #2 is the Eating Patterns Poster from the 2015 Dietary Guidelines for Americans series. 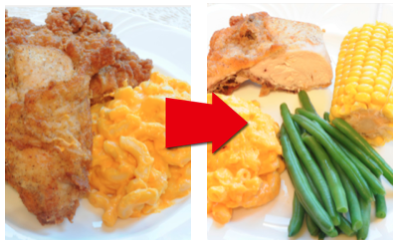 Its key lesson is to shift into a healthier eating pattern. 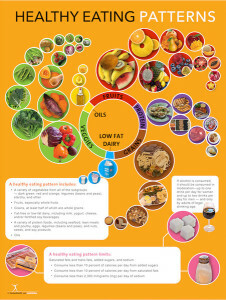 As you can see, this poster focuses on what is and is not included in a healthy eating pattern. With beautiful photos placed in a uniquely eye-catching arrangement, this post rocketed to the top of our list practically as soon as it was released. So why represent healthy foods visually? The photos demonstrate that healthy eating doesn’t have to be plain and boring. By making the foods that people need to consume look their very best, the photos in this poster add appeal to the eating pattern they’re illustrating. Plus, they provide a pop of color that would be welcome in any office, cafeteria, or display. How would you use this poster in your life? 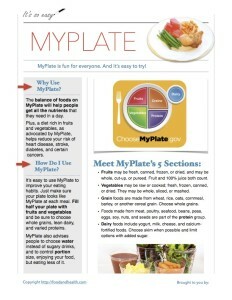 Finally, poster #3 is a classic — our very first MyPlate Poster. It teaches a fun way to balance your plate at each meal. 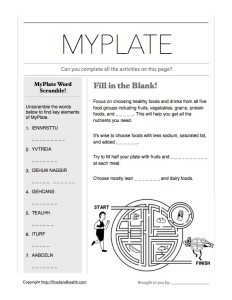 Ever since the USDA released MyPlate in 2011, it has been a popular tool to help educators teach their audiences about proper portions and proportions. As you know, My Plate offers a way to visualize a healthy and balanced plate at each meal, with half the plate filled with fruits and vegetables, grains taking up another quarter, and the remaining quarter of the plate filled with protein foods. A side of dairy rounds out the plate and completes the look. Each food group has its own lessons and tips, and they all come together to create a healthy eating experience. This poster highlights the most important aspects of MyPlate, illustrating each food group and drawing attention to the key lessons associated with each section of the plate. Its as memorable as it is engaging, and the My Plate poster has been getting rave reviews since we first brought it to the store. 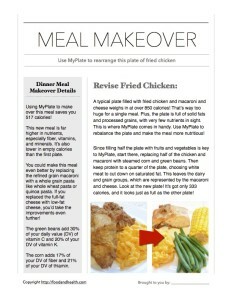 As an added bonus, I’d like to offer you an exclusive look at the handout that accompanies this MyPlate poster. Normally you could only get it if you bought the poster, but I want to make an exception today, so get your free copy of this handout now! And finally, here are some more of the materials that are at the top of the Nutrition Education Store right now!